Uniquely Wroxham Barns this winter..
Wroxham Barns is THE place to visit to get you into the spirit of the season and for fabulously festive Christmas shopping. 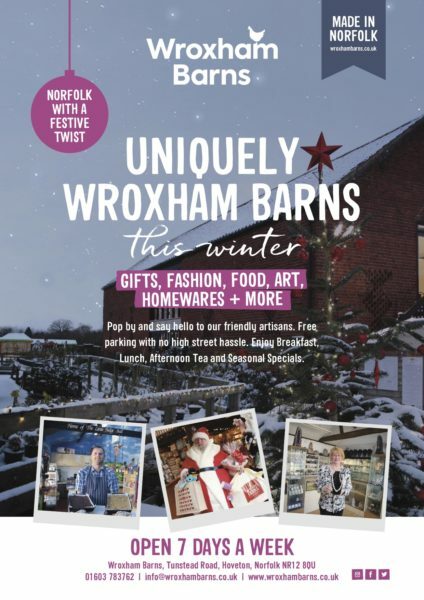 Enjoy the “Uniquely Wroxham Barns” experience in a range of shops and craft studios and find that special gift as well as picking up your favourite festive food, drinks and treats too. No High Street hassle here. Open daily 10am to 5pm with plenty of free parking. Don’t miss a visit to Gallery Gifts with stunning design-led ideas for the perfect gift and to Gallery Clothing with clothing, jewellery and accessories from your favourite labels and a friendly, personalised service too. At Lucia’s Studio you’ll find drawings, paintings and hand-painted ceramics by Lucia. Ask her about special commissions too. Pat’s Wooden Crafts & Engravings offer traditional and contemporary woodcrafts and also engraving; ask them about personalised gifts and Christmas photo baubles. A riot of colour is on show at Tim Foord Coastal Stained Glass with a fascinating range of items to add a touch of colour to any home. David and Jeanette at The Norfolk Gallery and Pictura offer not only a range of quirky home accessories, mirrors, occasional furniture and more but also inspirational paintings, prints and photography from both local and nationwide artists. Sue Windley has a range of exclusive sculptures and crafts including her stunning gemstone and pearl jewellery. Of course, there’s the Made By You Studio too where you get to have a go at Decopatch, Sand Art or Pottery Painting. Broadly Patchwork is the place to go for fabrics, threads, kits and so much more, including advice and guidance on your current stitching project. They even run Courses and Workshops above the shop. When it comes to seasonal foodie treats, Wroxham Barns has got it covered – at Courtyard Confectionery Ricky’s handmade fudge in an array of tempting flavours is always a winner and there’s a range of traditional sweets for that “trip down memory lane” too. While The Norfolk Cider Shop has ciders from East Anglia’s finest producers for your favourite festive tipple. Don’t miss a visit to Scrummy Pig for gourmet gifts and hand-selected quality produce from trusted small-scale local suppliers. They’ll put together a Gourmet Gift Hamper with your choice of goodies. Oh, and did we mention they stock around 150 bottled Norfolk beers too! At Art of You, our eco-friendly, cruelty-free hair and beauty salon a warm welcome awaits where they’ll pamper you from top to toe. Not sure what to get? A Wroxham Barns Gift Voucher is the perfect choice for amazing gifts that the whole family can enjoy. They can be used across the whole site – from fashion to farmyard fun, pampering to patchwork and crafting to cakes – and so much more! Buy online NOW. There’s something for everyone at Wroxham Barns this winter. See you soon!